Ok, thanks for the hoorahs, but it wasn’t anything that spectacular. Just 1.5hour spin to run the engine and unfurl the sails. but it was this years first. 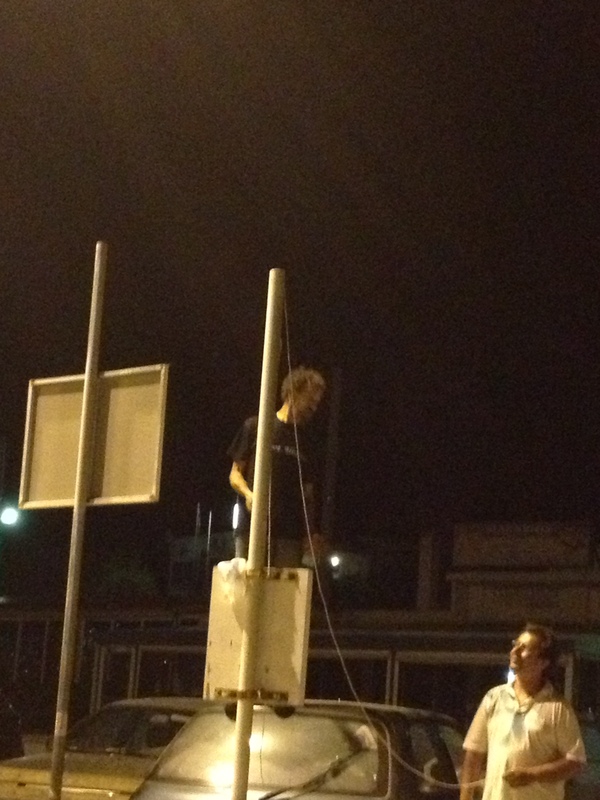 Onward then. ‘Tell ya about it soon. After a dumbass work week, Friday afternoon equipped with the second panel, I finish the solar panel installation. It was getting dark, Alex came by. 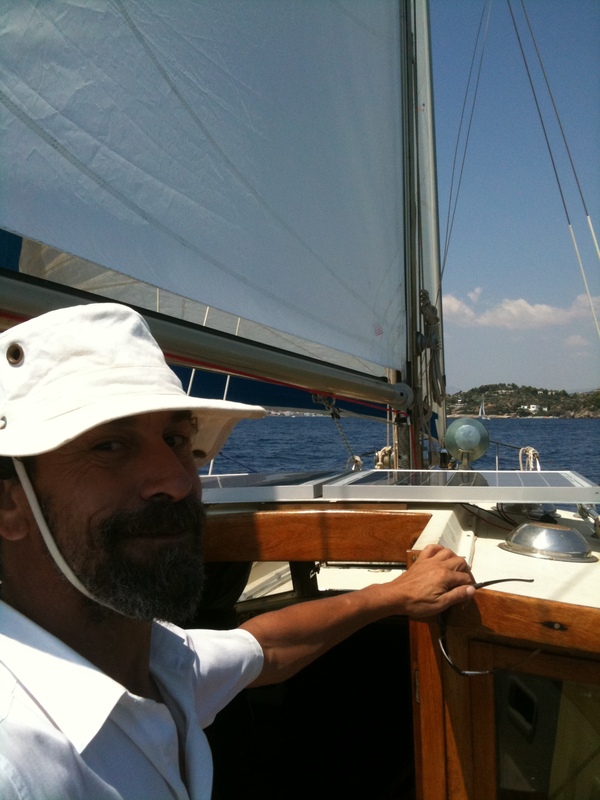 I was going to dingy to port with 2 water jugs but got a ride with him…(my first ride in his GibSea30 “Achilleas”) while dragging the poor Europa deflatable behind. A festive evening at the port with races and stuff, I eventually left at 3:30am for ol’ Zoot in the dark night, buzzing out of the harbor. Kinda wild being on the water so late at night on a rubber ducky. And I didn’t get lost this time! 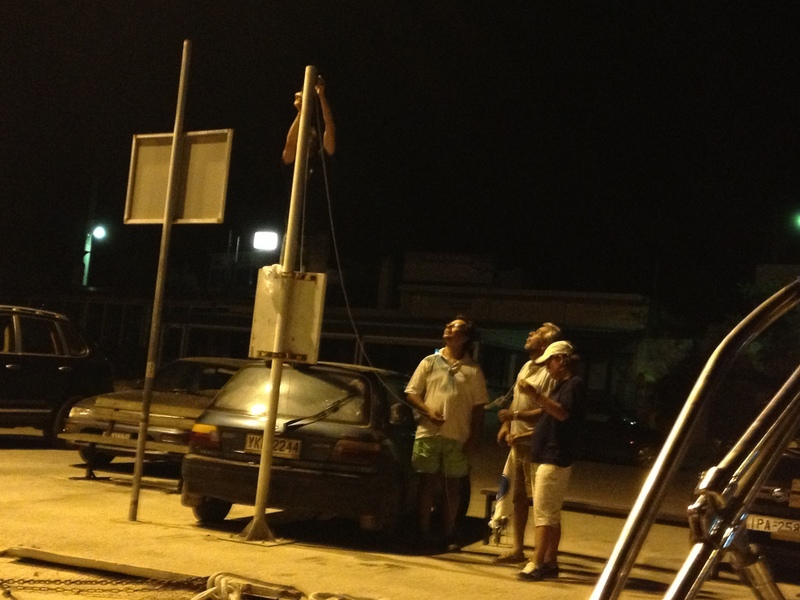 But before I left, I climbed on Kostas car to change the club flag. Since I didn’t kill myself, I was fit for the ” no, a monster will not jump out and eat me” night over the dark moonless waters. Yada, yada. So Saturday morning I was back at the port at 9am to crew Kosta and S/V Kaisi… another first and rare opportunity. Kinda fun and an interesting experience (leaving out details on an accidental jib/broach). Then we went for a swim and hanging and nibbling and drinking. Got back to ol’ Zoot by 6, took a half hour nap to be awaken by Hurricane (Hari) and her friend Kostas for their first visit… fully dressed! 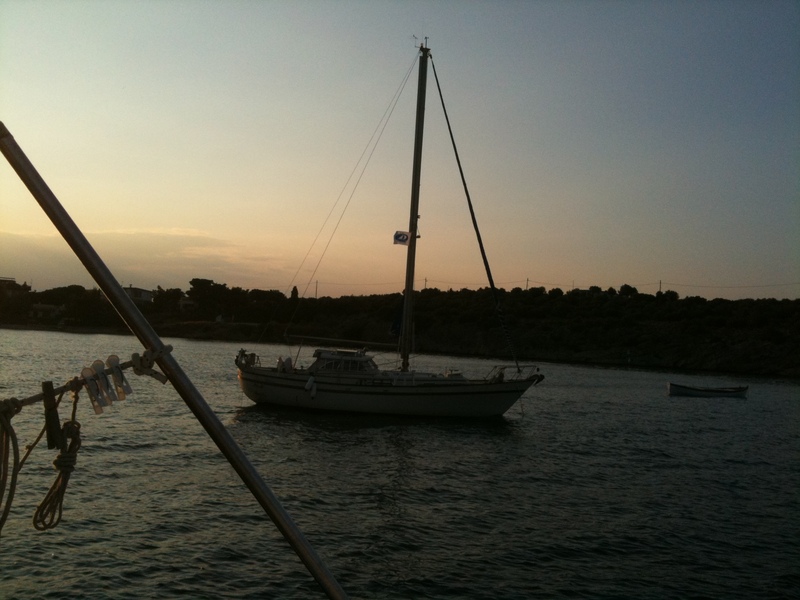 Totally groggy, I took a quick swim and we head out to the port for the annual club party. A tad boring, got back “home” at 2am. Up at 8 Sunday. Tidy up Zoot Allures for a ride (big mess since Friday+). 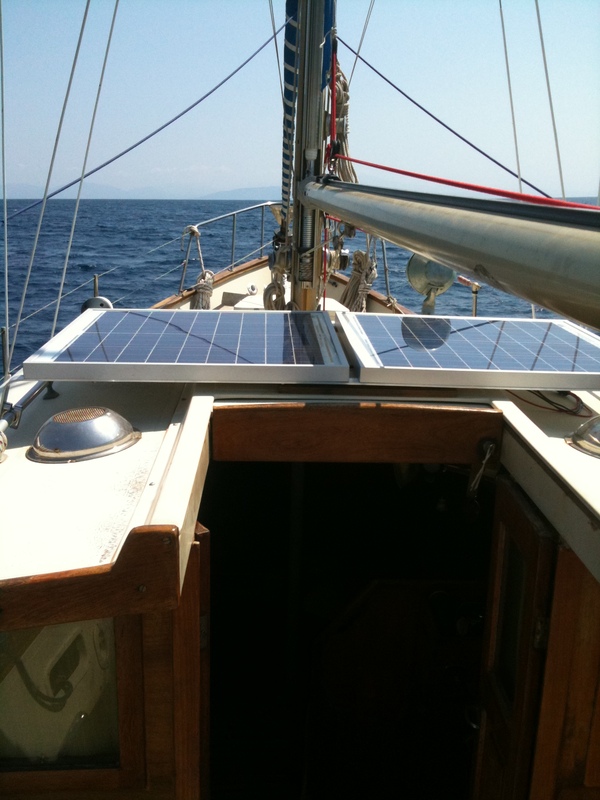 Fired up, untied the mooring, raised the anchor (which has issues raising… another post) and head out. 9-13knots, a beautiful day. Every thing went just fine, I was a bit rusty. The engine temp gauge did move but no way close to spec. (maybe 60C ?). 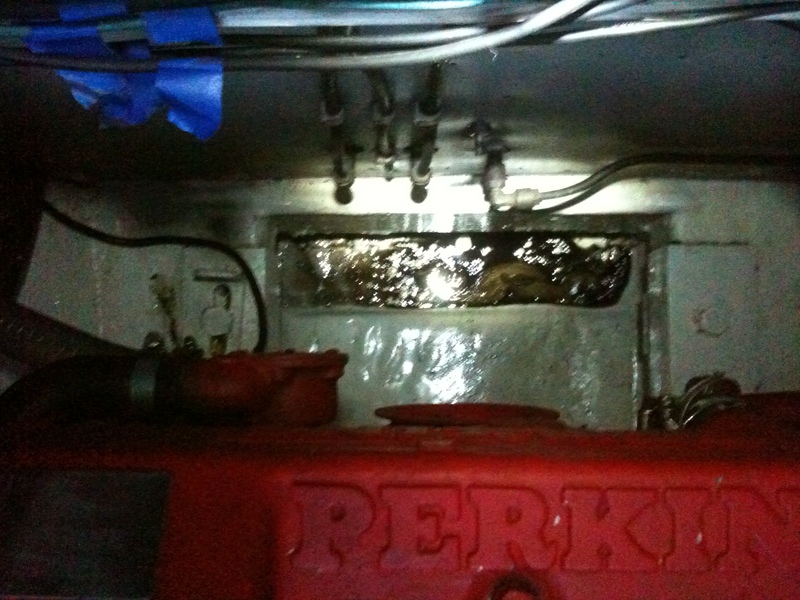 Some water in the bilge and the engine has some small oil leak (!) and some other fluid (water or fuel, dunno yet, not drastic, will look into soon, too tired and hot). 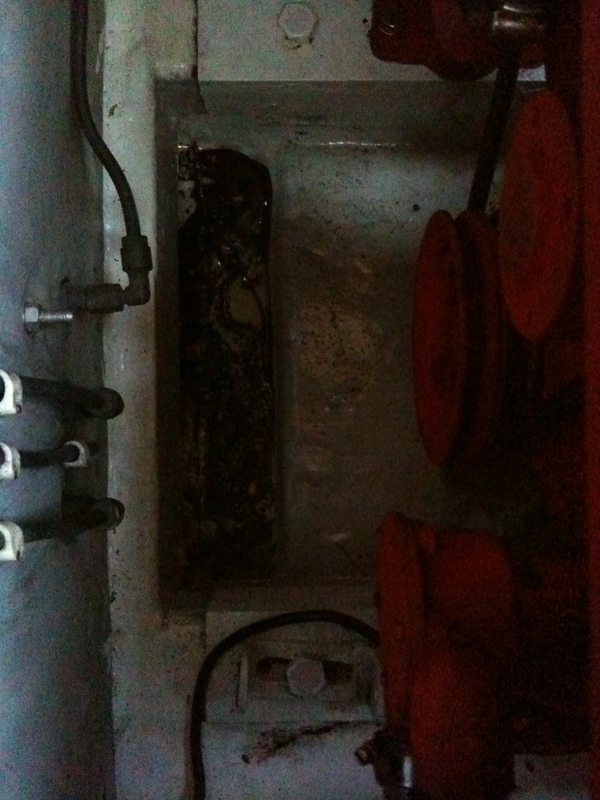 But the bilge modification is a grand success in this department! Quick and easy diaper clean up! Lack of appropriate sleep and relaxation took its toll. I blasted out to G.S. for lunch and family mini gathering, 2 ouzos and 2 wines and I was spent. I barely left for a much needed nap. Back on Zoot, slept 2.5 hours… frickin’ almost 7! Quick cup-a-joe and a cig (bad idea), I launched to mooring renovation/installment. I should give you more details and pics on that (you’d think). Many 6 meter dives later it was done and it was almost dark. Rapped up, hung a bit with Alex Efi and son Achilleas, and head back to town for another fun filled editing week which is proceeding just as sucky as planned. Oh, the joy! 3 days to go and none of that crap till September, woohoo! ps… previous ps. worked out minus the sleeping. pss.. I’m spending too much time on other people boats!! psssss.. tomorrow, 7 Beaufort winds, (20+knots). If the mooring gig went well, I’ll still have a boat. Otherwise I’ll just have to shoot myself somewhere!